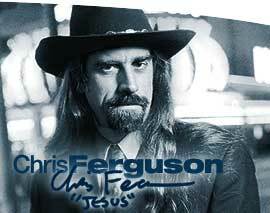 Chris 'Jesus' Ferguson - Poker God turned Poker Devil? Home » Players » Chris ‘Jesus’ Ferguson – Poker God turned Poker Devil? Chris ‘Jesus’ Ferguson – Poker God turned Poker Devil? 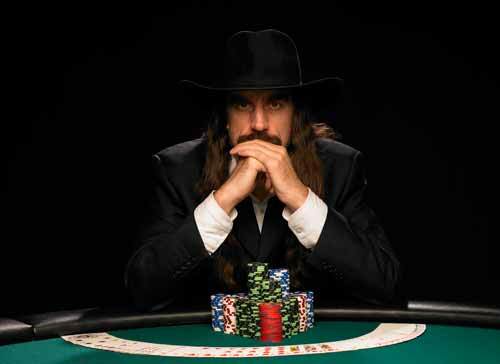 Chris Ferguson is just about the most well branded poker player about. Whether it was on purpose or whether by luck Chris has become one of the most recognisable poker players. He is now even more notorious in the industry due to his involvement in the former Full Tilt Poker before it was taken over by new parent company Pokerstars. Known for his Cowboy hat, smart black suits and his ‘Jesus’ like beard, there are not many poker fans around that don’t know who Chris is. Chris Ferguson is an academic through and through. Both his parents are academic professors at the University of California, Los Angeles (UCLA). His father in particular had an influence on Chris as he held a doctorate in statistics and gaming theory and was always passing this knowledge onto Chris by playing various different games with him throughout his childhood. By the age of 10 Chris was already playing Poker and the statistical and analytical side of poker was already being taught to him by his father. Chris went on to achieve similar academic achievements as his parents, first spending five years getting a bachelors degree in Computer Sciences. After this he then spent a further thirteen years as a graduate student working towards a PhD in Artificial Intelligence. During this time Chris spent his spare time earning money as a day trader, which financed his other hobbies such as Ballroom Dancing, and computer technology. It was while day trading that Chris met and became friends with Ray Bitar, a friendship that would eventually lead to the creation of Full Tilt Poker. In fact way before online poker, and even before the days of the world wide web as we know it, Chris was playing poker with his friends over Internet Relay Chat (IRC) which essentially was an early version of the internet before it evolved. Chris played Poker right throughout the 90′s and was entering local tournaments in L.A. He didn’t play too much on the tournament circuit and preferred playing his poker online at the time. He did however play in the WSOP events each year and he started to become noticed by other professionals and was well respected for his analytical approach to the game. It was in 2000 that Chris ‘Jesus’ Ferguson was thrust into the public spotlight, when he booked his place in history by winning the 2000 World Series of Poker Main Event and in doing so defeated one of the most respected and decorated Pro’s in T.J. Cloutier at the final table. Since then Chris has gone on to win over $3 million in WSOP cashes. After this, Chris became a regular on the Poker Circuit and built his persona around the nickname of ‘Jesus’ that he had been given. This persona is the same one that everyone recognises and loves today with the black suit, cowboy hat and trademark beard. Chris’s love of Poker and his interest and academic background in computer technology came together when he along with his friend from day trading, Ray Bitar, came up with the concept of Full Tilt Poker. Chris’s vision for Full Tilt was simple, an online poker site that is designed and owned and endorsed by actual professional poker players who know the game and needs of players better than anyone else. With this in mind, he and Ray started to build up the funding required for the start-up company with only well known professional poker players permitted to invest in the company who would not only offer much needed cash, but also bring their name, endorsement and knowledge to the table. It was this concept that fuelled the rapid growth of Full Tilt Poker backed by celebrity poker players like Howard Lederer, Phil Ivey, Phil Gordon, John Juanda and many others all who drew users and fans to the operator. Chris was the largest shareholder with a 19.2% ownership of what was now a billion dollar company. In fact Ferguson received $85 million in distributions from the company. Of course, the golden world of Full Tilt Poker turned black with the events of Black Friday where the US Department of Justice indicted and took action against key players in the online poker industry who were accepting US players. This led to spiralling events at Full Tilt Poker who had insufficient funds to repay players balances and were in effect bankrupt. This was eventually resolved by Pokerstars rescuing and taking over the company but many fans still blame Chris along with other major shareholders and directors for the mismanagement of the company finances which lead to the troubles the company suffered after “Black Friday”. CEO Ray Bitar was indicted in the original Black Friday Criminal case and a Civil Case was brought against Ferguson along with other directors Howard Lederer and Rafe Furst. Due to this animosity held against him Chris Ferguson has not been seen playing poker since 2011 when these events happened. It is expected that one day he will speak out and reveal some of the facts behind what happened in an attempt to clear his name. In a similar interview, another director and shareholder Howard Lederer spoke out in defence of Chris saying how he fought hard to keep FTP alive and even gave up $14 million that the company owed him in order to keep the company going for a little longer. Until we hear his side of the story, it will be difficult to understand his true involvement. Full Tilt Poker is now relaunched under it’s new parent company Pokerstars which is the largest poker operator in the world. Under it’s leadership Full Tilt has now grown once again to be the second largest online poker site, and is as popular as it has ever been.